...The train pulls in to Cluj, once the capital of Transylvania. From the train, I can see Tomas walking along the platform. He greets me with a big hug, then Eszter comes along, gripping my hand, as Tomas insists on carrying my case, the wheels having worn away completely earlier in the day. We take a wild taxi ride across town, and up the street where their apartment is, the car half falling to bits, and the inside clouded with choking petrol fumes. I first met Tomas and Eszter at a camp site in Vienna, where they were star attractions because of their rounded ancient Romanian car, with foldout tent on top. We communicated in German, and they gave us pretzels and homebrew vodka. The Jewish community in Cluj these days numbers about 500, mostly elderly, with many of the younger members intermarried, and in general, poverty stricken. It is one of the largest communities in the country after Bucharest. 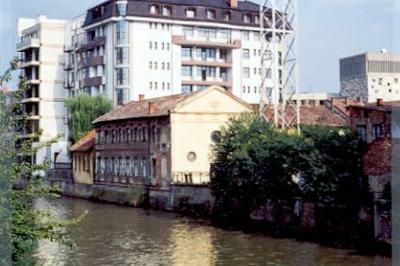 Cluj has three synagogues, the main one dubbed the Synagogue of the Deportees, and built in 1887 by the Reform community. It is now dedicated to those who died in the war. In 1944 the Germans established a ghetto in Cluj. Shortly afterwards around 16 700 Jews from the city and the surrounding area were deported to Auschwitz. Officially settlement in Cluj began in 1848 although there had been a Jewish presence from the 1700s. Tomas took me on a tour of the town, including a visit to several churches of different denominations, and the Babes-Bolyai University which has an Institute for Hebrew and Jewish history. Then in the afternoon, Eszter and I went out also, climbing the hill above the town where there is a lookout. On the way, whilst walking along the river, I find what seems to be an old brick synagogue right on the riverside, with youths playing sports outside. That evening Tomas brought out a little red folder from his overflowing library and sat next to me. Cautiously he took out a piece of paper and silently handed it to me, then another, and another... DP camp identity papers, letters from US officials confirming his imprisonment, letters from the Auschwitz Museum in response to his search for details concerning his family, postwar identity travel documents with photographs of Tomas, solemn face, shaved head, staring back at me. About 14 years old, deported with his parents and sister to Auschwitz from his home town in Transylvania. Then to Kaufering as a `worker’ for Messerschmidt, building jet engines, then to Allach, and on to Dachau. A slave labourer from 3rd May 1944 to 1st May 1945. Liberated from Dachau by the Americans, and eventually returning to Romania. We talk quietly in German, tracing his tragic story, the sole survivor of his family. Then leafing through a treasured picture album of the family in happier days. Lost days. The next day I depart by train for the Bukavina. I farewell Eszter in the morning before she heads away to her teaching job, and Tomas takes me to the railway station. I dedicate this exhibition to Tomas, and his family.